There was a time not too long ago when I didn’t want to have my picture taken. Sometimes I was the one taking the pictures but other times I just didn’t want to see myself photographed. 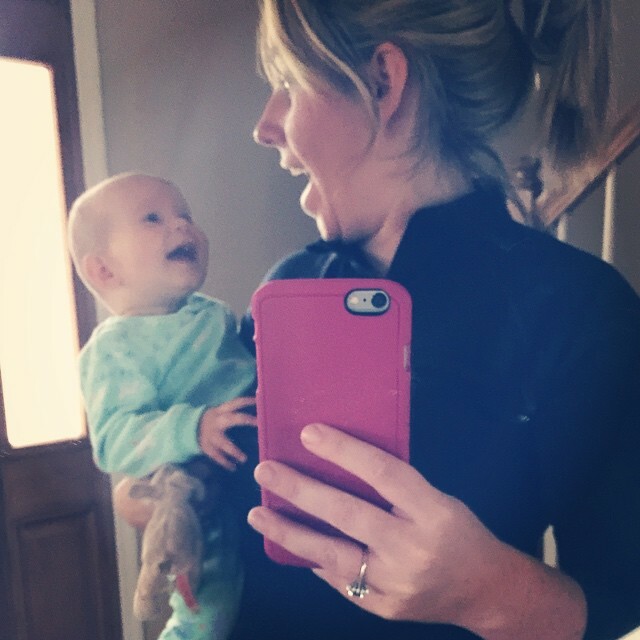 I was unhappy with the way I looked and I did not want my children to remember the time when mommy’s hips were more rounded and her face was a little fuller. 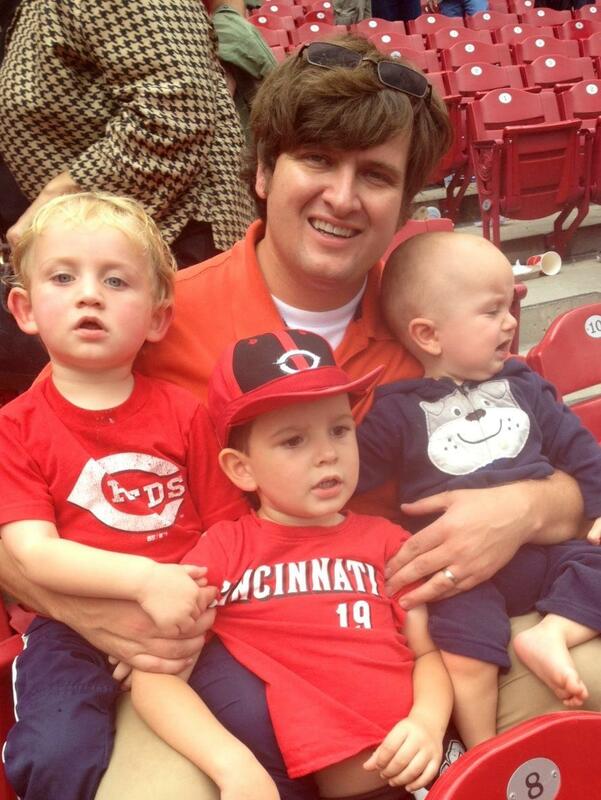 Specifically I remember being at a baseball game and I was gathering my boys close for a picture of them with their rally caps on. A young guy in the row in front of us sweetly turned around and offered to take the photo for us. He immediately looked puzzled when I quickly declined and told him I wasn’t planning on seeing myself in pictures for at least ten more years. That was really true and there it was: Out of my mouth my heart spoke the words: I am not beautiful enough to be remembered for who I am, right now, just this way. I have heard this story before. My mom rarely wanted to be photographed while she was battling cancer while I was a child. I hear my grandmother tell me, she did not want you all to remember her that way. I love my mother and that was her wish but now here I am left without her and I barely have any pictures with her and me in them. I cannot think of more than five photos I have of her and me together from the age of five until she passed away when I was fourteen. To me she was beautiful. As a child, I didn’t see a bald woman or a woman with only one breast. I saw my mother. And a mother is beautiful all by herself. 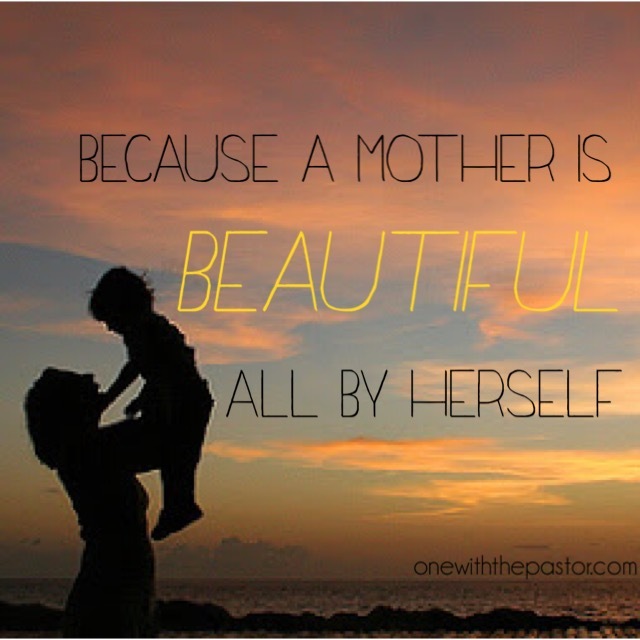 To my children, a mother is beautiful all by herself. There will be a time when I am no longer here on this earth and my sweet children will be longing for memories of me. My children will not be concerned about my chin, my dark circles, or my roots that should have been touched up last week. My children will just want to see me. And them. They will want to hold something more tangible than a memory that puts me with them in that place at that time. Our children don’t care how we look for the camera, because to them, a mother is beautiful all by herself. You can see I have some unraveling to do when it comes to this whole idea of being beautiful. Just the way I am. Right now. In this time. In this place. I will tell you I know what the Bible says about being beautiful. I will even tell you I have those verses memorized. But even though I know what the Bible teaches on a cognitive level about beauty – it doesn’t take a rocket scientist to see that the attitude of my heart and my unwillingness to be photographed show a tangled up mess of belief and unbelief when it comes to my appearance. What I believe and what I actually do just don’t match up. As God has been faithful to work on my unbelieving heart I can see the places where I have the “beliefs of the world” tangled up in what is true about beauty from the passages of Scripture. I’ve realized that to the people who matter, a mother is beautiful all by herself. God speaks to beauty in His words to us in the Bible and according to Him our beauty has nothing to do with the amounts of hairs on our head, the clothes that we wear or what the scale is saying about us on any given day. God’s words in the Bible do not say the same things the world is screaming to us about beauty. It is challenging to unravel the untruth from the truth. Mostly because as a mom, I am constantly surrounded by a world telling me to be thinner, to wear the latest trendiest boots, to be a hot mommy, to make sure my thighs aren’t touching. I could go on for days. Days. God is telling us from His word that beauty comes from the blatant opposite or what our world tells us is beautiful. Beauty comes from giving up of yourself. And chasing after Good. Beauty does from bravely enduring hardship. Like my mother. She is a heroine and I just won’t stop saying that. Beauty is a mother. Giving up herself. A mother is beautiful all by herself. A mother doesn’t need to hit that weight loss goal, make her hair the right color or wear the trendiest clothes. To God, your husband, you children, none of that matters. They want you in those photos. I know. And I am telling you. Go and be photographed. Hang those photos on the wall and post them to Facebook. Because a mother is beautiful all by herself. A few months ago I went to Legoland with my husband and our three sons. 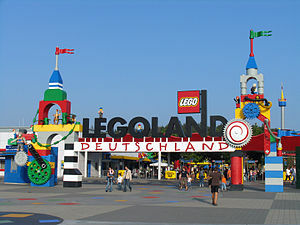 As you approach the entrance there is a large display that reads “Legoland” made from of course Legos. This is a great place to take a quick photo but for anyone that has three children four and under you know snapping a good shot is anything but quick. The children wanted to look at the Legos, touch the Legos and play on them. Not stand still for a photo. I found myself hurrying them along and as the line got longer with others wanting to take a family shot the pressure to go faster intensified. “Hurry,” I said behind my squinting smile. Just an hour later we were in the back of the park and I was standing near a ride’s entrance behind a stroller where my Caleb was napping while the big boys and Michael enjoyed a boat ride. I am an observer so as the time passed I was watched everyone and everything around me. I observed a group of school aged children on a field trip playing with one of the Lego structures. They were just being kids and having fun but I could tell their teacher was annoyed. There were others waiting for their turn as well. Of course my initial reaction was self-righteous, how could she rush them along like that? They are just enjoying themselves and not hurting anyone. But then The Lord humbled me and helped me recall my similar reaction at the front entrance with my own children. I began to think about the question, why hurry? We are always in a hurry. Hurry, get you shoes on. Hurry, get in the car. Hurry, it’s time to go. Hurry, I don’t have time for red lights or a traffic jam. As I listened to myself for the next couple of weeks I found that I was always rushing my kids along. I began to wonder if I was causing my kids to miss out on opportunities to just be kids and enjoy the moments of curious childhood. Not to mention all the stress I am causing myself by living in this state of go, go, go. My poor tiny heart is on the verge of exploding. With summer here (and blazing hot if I can just add that one too) in the Midwest it seems as though there is an impulse reaction to sign your kids up for every program you can. I don’t know if it is pressure to keep them learning or parents just needing to keep them in a routine. There is the pressure to keep up and to hurry. Summers seem to have become the busiest time of the year. With trips, camps and programs it is hard to slow down and it seems to be more difficult to track down my friends. I thought summer was supposed to be about rest. A season of siesta. I remember summers when I was younger: laying in the grass and making whistles out the green blades, catching lightning bugs, sleeping in the backyard, letting your bare feet withstand the hot pavement as long as you can, soaking up the sun at the pool or just laying around watching movies and reading books. Now with all the hurry summer seems to move by more quickly than the rest of the year which leaves little time to enjoy the season. I don’t know. But I don’t think it is a good thing that summer has gotten so busy because I am in such a hurry to keep my kids in a routine. I have been thinking about the verse, Be still and know that I am God. I will be exalted among the nations. I will be exalted among the earth. I can feel God telling me, Rachel, be still at the amusement park. I am in control and not the crowd of people surrounding you. Rachel, let your spirit be still when you are running a little late.Have I not written this story down? Is the pressure to have all three children to their classes on time outside of my doing? Rachel, be still this summer. Your children will survive if they don’t keep up with their reading and bible verses. I am in control of them too. I hold them in my hand. I don’t know the answer to my question, why hurry but I can tell you what I am trying to stop all the hurry and work harder to be still. Schedule lazy days into your routine. I am trying to build more lazy days into my schedule. Somedays we just need to reset. We stay in our pajamas, build forts, play dress up and eat PB&J on a blanket in the backyard. Bend the rules a little. When you don’t have anywhere to be in the morning it is easier to feel okay about letting your kids stay up a little later to catch lightning bugs or go on a late night trip in their pajamas to grab some ice cream. Watch when you say hurry. I always found myself shooing my kids off the curbs at the zoo and our local amusement park. I have tried to stop rushing them along and just let them walk on the curb, at their own pace. It slows me down but within the boundaries of our day it allows them to have a little fun. Don’t hurry, the summer will go by too quickly and it will be too cold for late night ice cream and back to backpacks and homework.